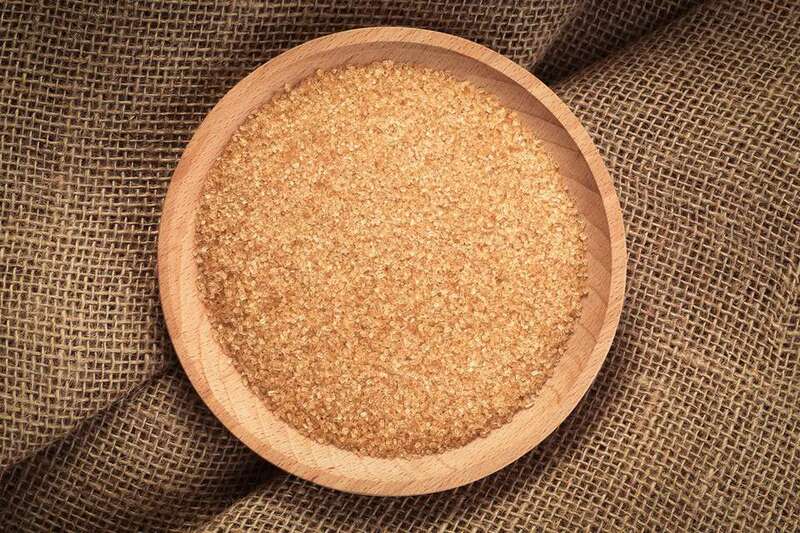 Demerara is a type of raw cane sugar with a large grain, crunchy texture, and pale brown color. While it is easy to find in some places, you might find it quite difficult to locate in others. If you haven't been able to track it down, or you're simply out of it at the moment, there are several other sugars that you can use in its place. Here's how to make a successful substitution. If you don't have demerara sugar on hand, use an equal amount of light brown sugar or turbinado sugar in its place. Both of these sugars have the golden brown color and subtle molasses flavor that demerara is known for. Turbinado is the preferred substitution as it has a coarse texture that is a better match for the texture of demerara sugar. Granulated sugar can also be used as a substitute for Demerara in a pinch. You can swap it out measure for measure. Since granulated sugar has a more delicate texture (and no molasses flavor) expect some texture and flavor differences in your recipe. You can make up for the flavor difference by adding one tablespoon of molasses to each cup of granulated sugar. If you are working on a recipe that calls for sprinkling demerara sugar on the top of your baked goods, sanding sugar would make an excellent stand-in, if you have it. Its big crystals will give you a similar visual appeal and crunch. But don't sweat it if you don't have this specialty sugar on hand. A dusting of brown sugar or granulated sugar will still look great and add a bit of crunch. Demerara sugar is partially-refined raw sugar that is made from the first pressing of sugar cane. Once the extracted cane juices evaporate, you're left with large grain sugar that has a golden brown color and a subtle molasses flavor. The small amount of molasses that remains in demerara sugar allows it to retain a little more mineral and nutritional content compared to granulated sugar. Many prefer demerara to granulated sugar because it's far less processed. Bakers like it because of the texture that it contributes to recipes. It's especially good to make a crunchy topping on baked goods. You can also sprinkle it on top of hot or cold cereal, fruit, or desserts for texture and flavor. Demerara sugar has become a favorite of coffee and tea connoisseurs, who have adopted it as the preferred sweetener for hot beverages. It lends a little toffee flavor to beverages. If you've never tried demerara before, pick up a couple of packets the next time you're in a coffee shop, and see what you think. Because of its looks, this sugar has also become a favorite of many mixologists for use in cocktails and on the rims of cocktail glasses. It goes exceptionally well with brown liquor drinks such as bourbon, aged whiskey, and dark molasses-based rum.